The 4th Class Power Engineering Program, offered exclusively by Sun West DLC, creates an opportunity for Saskatchewan high school students to complete both the theoretical and hands-on training required to be employable in the field of power engineering. Power engineers must be certified by an authorized regulatory body; in Saskatchewan, that agency is the Technical Safety Authority of Saskatchewan (TSASK). Our program is recognized by TSASK and follows the Standardization of Power Engineer Examinations Committee (SOPEEC) curriculum, so students who successfully complete all components of our program will meet the requirement for 4th Class certification. Learning materials for the four electives are provided online and learners can advance through that work at their own pace. Support is available from DLC teachers during the regular school day. Online exams are taken throughout each course, and these are used to determine a final mark. While a mark of 65% in each course is required in order to use the course toward certification, all students who receive a final mark of 50% or higher will receive a Saskatchewan high school elective credit for each course completed. Learners who are not planning to complete the full Sun West program, including labs and steam time, may choose to take only the online theory courses. The theory courses can be used toward certification, but the learner will have to arrange to fulfill the practical requirements for certification elsewhere. Institutions such as Saskatchewan Polytechnic and Lakeland College offer 200-hour steam labs that fulfill the practical requirements. The lab component is comprised of six weekend boot camps held intermittently throughout each year. Learners may choose to attend these boot camps in either Outlook or Kindersley, depending on what suits them best. In these labs, learners will operate machines that simulate those in a real work place. They are mandatory and lab fees are included in DLC course fees. Exact lab dates TBD. 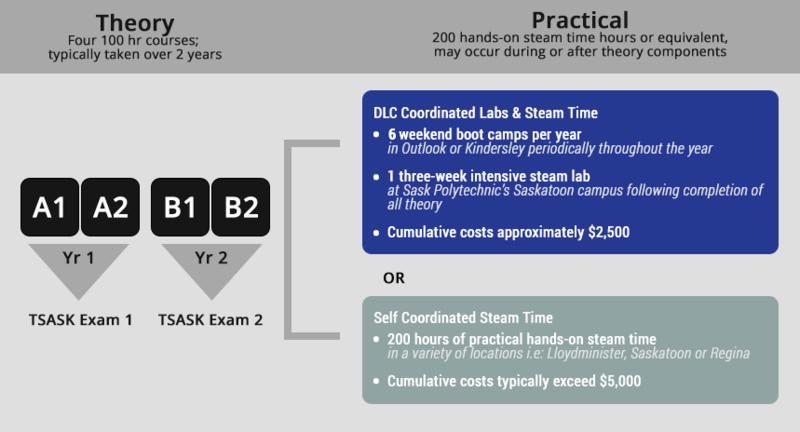 Having successfully passed the four courses, and 80 hours of lab time, learners are required to complete an additional 120 hours of supervised steam lab time at Saskatchewan Polytechnic (Saskatoon campus). These steam time hours, which take place over a designated three-week period in July, must be completed in order to apply for certification. Although this training takes place on the Saskatchewan Polytechnic campus and is delivered by Saskatchewan Polytechnic instructors, DLC staff will help to coordinate the logistics and support students through the registration process. There are notable costs associated with the steam lab component; see the table below for details. Students must confirm their July steam time seat by April 30th with the full payment of fees. Seats are filled on a first come basis. A minimum of 12 students is required to run the steam lab with a maximum of 18 spots available. In order to meet the requirements for certification, learners must pass two TSASK exams. The Part A exam is written after completion of the A1 and A2 courses, while the Part B exam is written after completion of the B1 and B2 courses. These exams are administered by TSASK, and take place in Saskatoon and Regina, as well as other locations, throughout the year. Sun West students will be provided with a Pan Global e-Textbook. All other students see below for details. Non-Sun West students and Adults, please note that there will be additional fees for the textbooks in this course (if you have not already purchased them). The Part A textbook costs will be approx. $500. More details will be provided after you register or call us at 306-252-1000 for more information. Students must be independent, organized, strong in math and science (think successful in Physics 30), and motivated. The program is written at a post secondary level, but Sun West DLC teachers will provide supports to help high school students through the content.